Yep, this isn't the right cover .. couldn't find one for the new record. oh wait, I forgot, they couldn't because they reencoded this. know what the source was. Streetdate is 24. june(!) 2008. 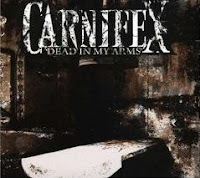 Carnifex is an american Deathcore Band signed to Victory Records by the way. to turn your speakers flat out loud.